Welcome to the islands of endless summer. Close your eyes and imagine sparkling blue waters rolling up on pearly white beaches. From quaint fishing villages, to vibrant colonial cities, to deserted beaches and secret anchorages, you can plan your Caribbean itinerary with an abundance of things to do. Then again, the Caribbean is the best destination for those who want to do nothing more strenuous than sit under an umbrella and read a book. The Caribbean comprises two main island groups, the Windwards and the Leewards, and each group has more than enough islands for any one holiday. 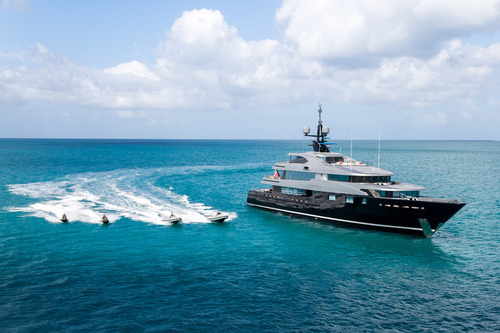 While each island has its devotees, the primary charter yacht hubs are the Virgin Islands, Antigua and St. Martin. 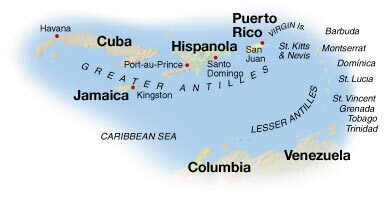 The Virgin Islands are divided between U.S. and British territories. The U.S. Virgin Islands are St. Croix, St. John and St. Thomas. In St. Thomas, the liveliest of the U.S. Islands, you will find some of the best dining and duty-free shopping in Charlotte Amalie. 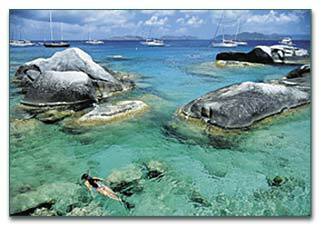 The British Virgin Islands are grouped around the Sir Francis Drake Channel. This passage is among the world's grand boulevards for cruising yachts. Scenic Road Town, Tortola, the island capital, tempts visitors with every sort of regional and international cuisine. Virgin Gorda lies east of Tortola and is home to the famous Baths -- an arrangement of shallow pools and grottoes which flood with crystal clear sea water creating an unforgettable setting. Nearby snorkeling is excellent. Jost Van Dyke, with its charming, informal bars and restaurants, is the “party island” of the BVI. Anegada, totally surrounded by a protective reef, is the most remote. With miles of untouched beaches along the western and north shores, itis sometimes called "The Beach Lover's Island." Extensive offshore reefs and wrecks are -home to lobster and exotic fish and marine life. 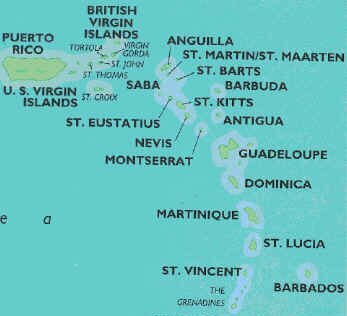 Antigua, located on the northeast shoulder of the island chain between Montserrat and St. Kitts, is the largest of the British Leeward Islands and is the birthplace of the charter industry in the Caribbean. Historic Nelson’s Dockyard bustles with boutiques, inns and restaurants. St. Kitts, the first English settlement in the Leeward islands, and its sister island, Nevis, are mountainous beauties replete with long stretches of seductive beach, tropical rain forests, and beautifully restored plantation house inns. Nevis boasts a superb 18-hole golf course at the Four Seasons resort. Whale-watching is excellent November through February. St. Martin/St. Maarten features two sovereign nations sharing one island. Here you can experience Dutch and French cultures with one stop. Whatever can be done on or in the water—water skiing, windsurfing, diving, and snorkeling—is available here. The duty-free shopping is as good as anywhere in the Caribbean and top-notch restaurants, especially on the French side, will tempt diners. A short sail away, St. Barts is a must for many yachtsmen. This fashionable haven for celebrities and the ultra chic set is the St. Tropez of the Caribbean. The island blends the essential quality of the Caribbean with the savoir vivre of France. Exceptional boutiques carry the latest in haute couture fashion. In fact, you can have a totally French experience on the tropical isles of Guadeloupe, Martinique and Isle des Saints. Dramatic coastal scenery with soaring cliffs, sun-dappled grottoes, waterfalls and an underground river makes a backdrop for classic French dining with fine French wines. St. Vincent and the string of 32 islands and cays that make up the Grenadines are a single nation.. Luxury yachts ply from island to island, delivering their passengers from quiet villages to secluded beaches and open air bars. Just south of St. Vincent is lovely Bequia, the largest of the Grenadines. Its Admiralty Bay is one of the more popular anchorages. Within easy cruising distance are the tiny, uninhabited Tobago Cays. Avid snorkelers claim that these cays have some of the best coral formations found outside the Pacific Ocean. Idyllic Petit St. Vincent and Palm Island are popular, upscale stop-offs. St. Thomas -- Bustling with activity, this well known island offers an international airport and lots of shopping and good restaurants. St. John's -- Home to Caneel Bay resort, sandy beaches, anchorages and snorkeling spots. Tortola -- A center of activity in the BVI, jagged mountain peaks to the north are covered with frangipani and to the south, beaches lined with palm trees. Watch the sunset in beautiful Cane Garden Bay. Jost Van Dyke -- Named after a 17th century Dutch pirate, a picture perfect island whose palm fronded beaches welcome you. Virgin Gorda -- A favorite stop-over with lovely beaches, home to Biras Creek resort and the Bitter End Yacht Club, this picturesque island offers beautiful beaches. A must is a visit to "The Baths", formed by an ancient volcano, this unique rock formatin offers caves with private swimming grottos. Anegada -- Located only 28 feet above sea level, this island has some of the best offshore wreck diving in the world. Peter Island -- Home to a major resort and yacht club, this island boasts secluded beaches and picnic spots. 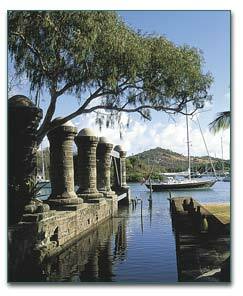 Norman Island -- Believed to be the original setting of Robert Louis Stevenson's "Treasure Island". Local lore is that hidden treasure has been found here. Explore the caves or snorkel and search for dubloons. Necker Island -- This beautiful private island is owned by Richard Branson and rented out selectively. The Balinese villas and architecture are incredible. Salt Island -- has evaporation ponds which are still panned as they were two centuries ago; the pure salt is packed and sold. Scenes for the movie "The Deep" were filmed here. St. Martin -- Half French and half Dutch, this island has a split personality. The Dutch side is home to the casinos and duty free shopping; French Marigot Bay is charming - lots of lovely cafes and lovely anchorages. Visit the stunning La Samanna resort here for dinner. Anguilla -- This tiny island has beautiful powder white beaches and crystal clear water - enjoy diving on one of the many wrecks and reefs. Visit Cap Juluca resort's Pimm's restaurant. St. Bart's -- The St. Tropez of the Caribbean, St. Bart's is home to the jet set. This cosmopolitan island is only 8 square miles filled with excellent shopping, beaches and spectacular views. Have a drink or lunch at the Hotel Guanahani. Prickly Pear Cays -- A truly deserted island, the perfect playground for watersports and privacy. Enjoy a barbeque on the beach. St. Kitt's -- A gem of an island, home to Brimstone Hall, "Gibraltar of the Caribbean". Columbus named it for himself and his patron saint, Christopher. St. Eustasius -- Once the richest trading port, "Statia" boasts one of the oldest synagogues in the west and has fabulous diving sites, including Lawtown, a city which slid off the island and now is under the sea. Antigua -- For centuries, a British base under Lord Nelson, filled with beaches and a yachtsman's paradise. A yachting paradise, English Harbor is filled with sailing yachts and the Antigua Yacht Club has a collection of the large mega-yachts. Visit the St. James Club and dock here; have drinks and listen to the steel band at the top of the island, Shirley Heights. Barbuda -- surrounded by reefs, find isolated beaches, superb diving and deep sea fishing in crystal waters. Krizia's K Club hotel is here. Nevis -- A beautiful Four Seasons hotel is the centerpiece of the island, with a phenomenal golf course. Montserrat -- Ruggedly beautiful volcanic island and Sourfriere, then highest of the 3 mountains, Montserrat has been rumbling, with occassional eruptions. Visit the mineral springs. Martinique -- This is the largest of the Windward Islands. This volcanic island is the birthplace of Josephine, Napoleon's wife. This is a French island, with many shops, restaurants and beaches. St. Lucia -- Lush and mountainous, St. Lucia offers many beautiful anchorages and several different climate zones. Anchor in Marigot Harbor or Rodney Bay. Hike up "twin peaks", the 2,500 foot Piton mountains. The beach below, Soufriere Bay, is home to the island's baby elephant who roams freely. St.Vincent -- Full of rugged natural beauty - black volcanic sand beaches with excellent diving. Bequia -- Accessible only by boat, the natives still hand craft small boats. Sandy beaches and crystal clear water provide a tranquil atmosphere, with beachside restaurants along Admiralty Bay. Mustique -- Hideaway for the rich and famous, there are 450 year round residents and room for only 100 visitors on shore at Mustique's only hotel, The Cotton House. Fabulous white beaches, clear waters and privacy are a few reasons to visit. Have a drink at Basil's Bar while you're here. Tobago Cays -- A cluster of uninhabited cays with excellent diving. Many secure anchorages lie within the maze of colorful reefs. Petit St. Vincent -- Enjoy diving, beaches and watersports. Carriacou -- Deserted beaches and bays. Visit Terrill Bay, home to dozens of species of birds, some rare. Grenada -- The spice island has beaches, waterfalls, rainforests and the air is perfumed with fragrant spices. 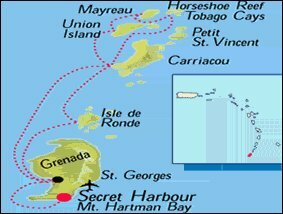 A great place to begin or end your journey through the Windward Islands. You can tour a working nutmeg factory, still run as it was in the early 19th century.